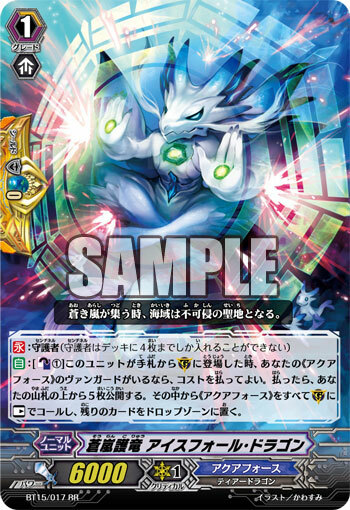 [AUTO]:[Counter Blast (1)] When this is placed on (GC) from your hand, if you have a «Aqua Force» vanguard, you may pay the cost. If you do, reveal the five cards from the top of your deck, call all «Aqua Force» from among them to (GC) as [Rest], and put the rest into the drop zone. "When a blue storm gathers, the ocean becomes a holy land where hostilities cease." A member of the elite force “Blue Storm Armada” lead by “Maelstrom”. His rank is Ensign. He is the head of a historic clan that has protected the ocean depths since ancient times, protecting it from scoundrels for hundreds of thousands of years. He has special stone organs filled with magic that grows in proportion to its body, whose powers respond to the feelings of the host. He’s allowed others to analyze these stones many times, but analysis results still haven’t concluded anything. Also, the Pyroxene that “Emerald Shield, Paschal” uses is a by-product created from this research. However, it isn’t a part of the body like these dragons, so it regularly has to be fed magical power. As a result of a deal with Maelstrom, the entire clan enlisted in “Aqua Force”, swearing to protect the ocean depths, As along as this agreement stays in tact, the navy will continue to receive the divine protection of their impenetrable ice wall. The nickname for the forces lead by Vice Admiral Maelstrom who just awoke. They’re a fighting force made up of extremely talented in either combat or brains. Although this group isn’t very stable, it’s said the Blue Storm Armada’s skills surpass even those of the elite of the “Tidal” Corps, and have increasingly become the center of attention within Aqua Force.